As Christmas approaches I am reminded of 6 years ago. I was very fortunate to travel home during the holidays. Not everyone was so blessed. Some had to stay and work and there are others, others that will never come home again. My thoughts as I write are of you, your families, and your sacrifice. I am truly sorry for your loss. The Table at Christmas! 2009. Many of the members of Roto 8, Task Force Freedom had been home to Canada for their first of two 14-day breaks from theatre; myself included. For those of us exposed to ‘outside the wire’ operations everyday; trying to calm down for two weeks was mentally challenging. Although friends would see the relaxed attitude on the faces of the warrior, family members would recognize that our minds and souls were not relaxed – that they were still in KAF. For me, my first break was surreal. I arrived in Dubai at Camp Mirage on Christmas Eve Day. In MIRAGE, there was green grass, clean buildings and civilized happy Canadian soldiers supporting the daily airlift into Afghanistan. It was nothing like KAF. There was an outdoor entertainment stage that played evening movies. Tonight it was celebrating Christmas eve. A pastor gave a sermon and soldiers sang carols. I could tell I was already affected when listening to a midnight Christmas eve mass. I tried to appreciate the gratefulness but being angry at the ‘excess’ we took for granted when soldiers and innocents were being murdered preoccupied my judgemental psyche. Within days of this meal, numerous Canadian soldiers died as well as three girls at a girls school near KAF – slaughtered just for going to school – yet I was enjoying a turnkey dinner in a tropical shangri-la. It was delightful, yet I couldn’t release my thoughts from colleagues who at that moment were tracking IED planters or providing over-watch. I know it was wrong to be judgemental, but I couldn’t help this subtle anger; I carried it. I couldn’t get past my thoughts of the next mission in January; yet I was suppose to be relaxing. On return, I was to participate in some large-scale missions that would use all NATO helicopters in southern Afghanistan; but no information was passed at this point. Only that it would be really messy. The next morning, Christmas morning, I spent a day at the beaches in Dubai and touring the malls and world’s largest skyscraper – mechanically trying to enjoy a bit of tourism. I walked to the beach and observed young men playing soccer, a dad and daughter playing frisbee and couples shopping. Initially not noticing the difference. Then it occurred to me. There were no teenaged women anywhere. No young females without escorts, and the burka wearing women walked several steps behind their husbands. The man playing frisbee was with an 8 year old daughter; pre-pubescent. No young adolescent girls were out without older women or escorted. 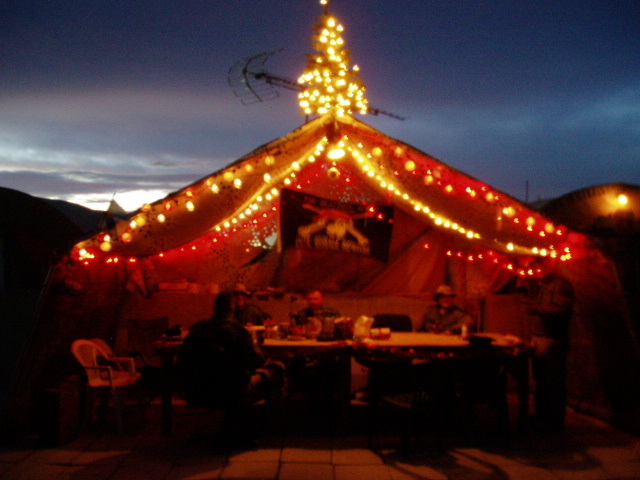 I had to return to Camp Mirage in the afternoon to catch my evening flight to Canada. A man dressed as Santa Claus was entertaining the Christian families at the resorts. It was ironic how a primarily Muslim country would offer the respect to indulge the western traditions; yet in Afghanistan, Taliban would execute the same behaviours and claim it justified under sharia law. I arrived in Canada on the 26th. I met my family in Victoria, on the west coast of Canada. For the first time in my life, I truly embraced the early morning walk in the cold drizzly west coast weather. No dust. No poo-pond. I remember one drizzly morning I strolled in the cold rain to a local coffee shop just prior to New Years and pulled up a street-side seat with a newspaper. 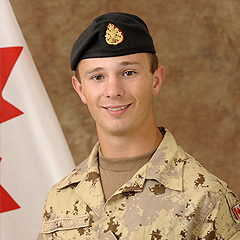 I read the first page: ‘4 Canadian soldiers and one reporter killed.’ I started to shake as I read the article: 21 year old Zachery McCormack from my home town was dead. He was just a kid. It hit me hard – my eyes swelled up and I turned to the window in the coffee shop to hide my tears; sipping coffee to cover up and gain composure. I couldn’t stop thinking about his family. After shakily gulping back some air and inhaling some moisture from my eyes, I walked back to the hotel to be with mine. He was so young, not much older than my son, and from my neighbourhood. I visited relatives for a few more days and then proceeded back to Sherwood Park to re-integrate into regular family lifestyle for the second half of my time off. I was at the arena and I watched my daughter win her first ever ringette tournament. The girls played ‘pump-up’ music in the locker-room before the game to get motivated. All the parents could hear the music from the stands as the 9-year-old girls proudly tried to out party the other team as they entered the ice. My boys sat with me on the cold bench also enjoying the pre-game show — a family event. Although, I was smiling and happy outside, I was stoic inside. My mind had to go back to KAF soon, outside the wire, and wouldn’t release my soul to fully connect in the moment. There was the song. The Black-eyed Peas began to dominate the rink as the doors from the change room opened allowing a stream of young warrior princesses out to rally. Some stumbling on their skates, others tripping onto the ice as they forgot to take their blade guards off. Parents chuckled and big smiles could be seen clearly through the face guards of the young girls’ helmets. “Sure is nice that you could get some time off at Christmas.” One of the parents stated. “Yes, I’m glad to be home.” I answered. “Your daughter has really improved this year, you’ll be surprised when she starts skating!” He added. I hadn’t seen her skate since the summer. She was pushing with one leg, the other was stiff. Only one blade was used for braking. “There she is,” my wife pointed. “Wow! She’s skating normally now…and she stopped sideways.” I was amazed. “Oops, she just fell!” I laughed. She smiled back at me proud to show off her new accomplishment. “She can only stop one direction so far but she’s getting better.” The other parent said. “Did you notice her helmet?” My wife asked. “They all do.” She added. I looked around and noticed all the girls had yellow ribbons. I straightened up and took a proud breath. “Why do they have those? Does the league have the girls wearing them for the soldiers?” I asked. “I’m gonna grab a coffee, anyone want one?” I was overwhelmed by the support from the team and parents. However, my mind couldn’t leave KAF. I couldn’t allow the emotions to cut through my focus. It may have been psychologically naive, trivial, but it was the ‘war-face’ that had to maintain despite wanting to be home. I was so grateful at the freedoms my family had, and how the young girls could play, yet, I couldn’t help thinking about a few days prior to coming home for this break, a bomber blew up a school two miles from KAF. It was a girls’ school. Three girls died. Girls my daughter’s age. Why? The souls of numerous families were fractured. Would there yellow ribbons on the compounds for those families? I had to stay this way. My break vanished quickly. I wanted to be home, but I needed to get back to KAF and get it done. My soul was locked up until this year in Afghanistan was complete. I wasn’t sure if I was guarding my soul or just accepting mortality in order to quit worrying about it. How could one tell the difference? Merry Christmas – Embrace each other! RIP 30 Dec 2009, Zachary Mccormack. As with most of your posts, I feel a need to say something, but that anything I say would seem trivial. So I’ll repeat my usual response, and hope you know something of the effect your words have: Thank you. Thank you for posting this. So glad to know you. You are incredible. Wow! Thank you so much for those kind words. I’ll try to work hard er and improve because I dint think I’m deserving of the compliments…but you encourage me to be proud and do better. Thank you.